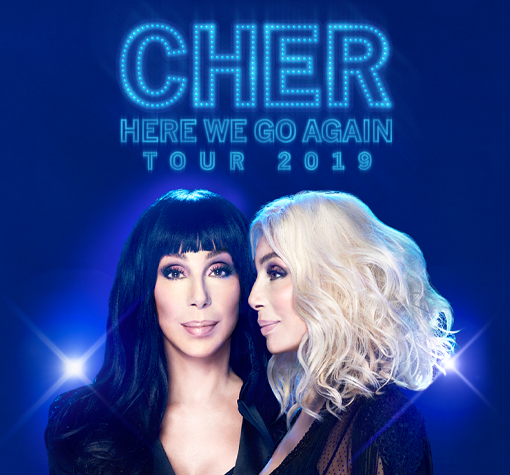 The Here We Go Again Tour is the seventh solo concert tour by American singer-actress Cher in support of her twenty-sixth studio album Dancing Queen. This is the first time the singer has embarked on a world tour since her Living Proof: The Farewell Tour. Born on May 20, 1946, in El Centro, California, Cher rose to stardom as part of a singing act with husband Sonny Bono in the 1960s, hitting No. 1 with the single "I Got You Babe." The couple later starred on The Sonny and Cher Comedy Hour, though the show ended as the couple's marriage dissolved. Cher had established a solo career of her own as well, having chart-toppers like "Gypsies, Tramps and Thieves," "Half-Breed" and "Dark Lady." She then pursued acting in the 1980s, starring in films like Silkwood and Mask and earning an Academy Award for her performance in Moonstruck. Cher also found more music success with rock-oriented tracks in the '80s and a global dance hit, "Believe," in the late '90s. From 2008 to 2011, she performed a concert series entitled Cher at the Colosseum at Caesars Palace in Las Vegas. In 2013, she released Closer to the Truth, her first studio album in 12 years. As she explained to Reuters, Closer to the Truth is "my best effort ever, so I'm happy with that." She enjoyed more dance chart success with album singles “Woman’s World,” “Take It Like a Man” and “I Walk Alone.” Cher returned to touring in March 2014 to promote Closer, but had to cancel dates due to a kidney infection. In February 8, 2017, the music legend returned to the stage, launching her Classic Cher show at the Park Theater at the Monte Carlo Resort and Casino in Las Vegas. Her tour de force performance included some of her greatest hits and costumes designed by Bob Mackie. In May 2017, the pop legend received the Billboard Icon Award, after a high-voltage performance of her hits "Believe" and "If I Could Turn Back Time." In her acceptance speech, she spoke about the longevity of her music career: "So, I've wanted to do what I do since I was 4 years old. And I've been doing it for 53 years. That is not an applause thing, I'm 71 yesterday. And I can do a five-minute plank, okay? Just saying." Later that year, a full-length trailer for Mamma Mia: Here We Go Again!, the sequel to the 2008 adaptation of the popular Broadway production, showed the ageless diva reuniting with her old screen colleague Meryl Streep.